Next generation Combiner / Multiplexer that has full isolation on all inputs and all outputs. 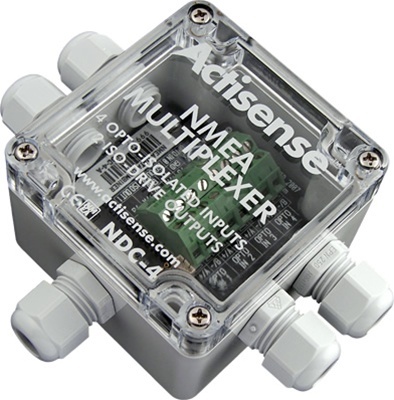 NDC-4 Base unit pre-configured as AIS Multiplexer, with USB cable. Using the ISO-Drive Actisense technology, ground loops are now a thing of the past. Can Combine or Autoswitch up to 5 devices, plus filter out any problematic or unwanted NMEA sentences. The NDC-4 has two ISO-Drive outputs which are fully compatible with all standards: NMEA 0183 (RS422), RS485 and PC RS232 ports.